There's never been a better time to get into data science. But where do you start? Data Science is a broad field, incorporating aspects of statistics, machine learning, and data engineering. It's easy to become overwhelmed, or end up learning about a small section of data science or a single methodology. Exploring Data Science is a collection of five hand-picked chapters introducing you to various areas in data science and explaining which methodologies work best for each. 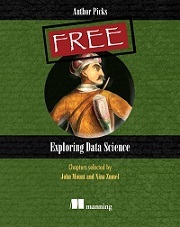 John Mount and Nina Zumel, authors of Practical Data Science with R, selected these chapters to give you the big picture of the many data domains. You’ll learn about time series, neural networks, text analytics, and more. As you explore different modeling practices, you’ll see practical examples of how R, Python, and other languages are used in data science. Along the way, you'll experience a sample of Manning books you may want to add to your library.